Carreg Samson chambered tomb looking north towards the Irish Sea on the horizon. Carreg Samson, marked on the OS map as Careg Sampson and otherwise known as Samson's Stone and the Longhouse crouches low in a farmers field above the bay of Aber Castle gazing out across the Irish Sea. A large capstone 4.5 metres long by over 2.7 metres wide perches on three of the seven uprights, the monument being the remains of a large chambered tomb, although any sign of a covering mound if it existed has now disappeared. 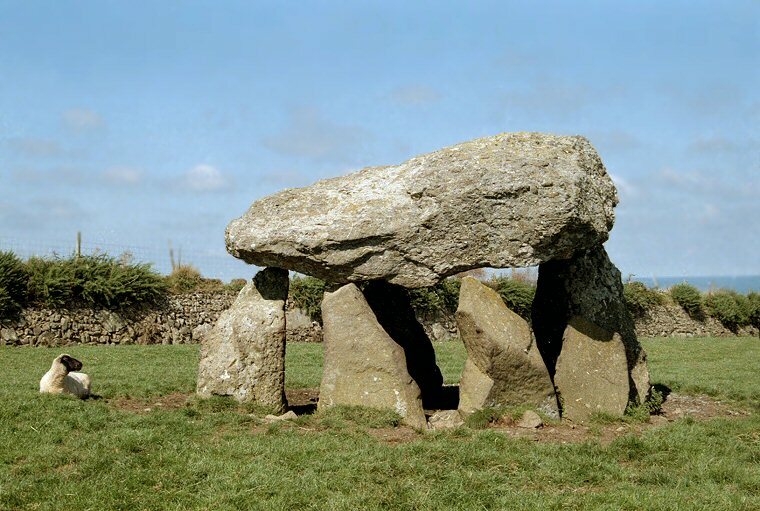 It has been further suggested that Carreg Samson was in fact a passage tomb but any trace of the low row of stones that may have formed a passage from the side of the mound up to the entrance of the chamber has also vanished. 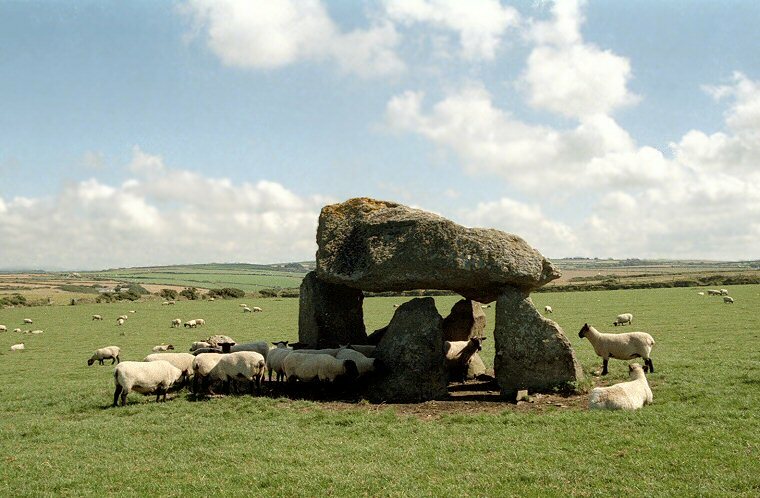 A hundred years or so ago the dolmen was used as a sheep-shelter, now the sheep (or sometimes cattle depending on what the farmer has grazing in the field) seem to come to the monument by instinct, to rest from the sun's glare or the beating rain. The Longhouse is now their house. The Samson connection comes from the legend that St. Samson put the capstone in place himself, using just one finger.